This pocket NAS crashed all stereotypes. 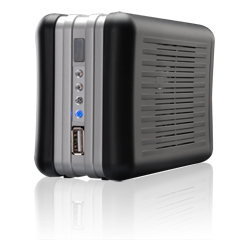 “its portable nature and a wide range of functions allows users to use the device as a print server, video surveillance server, portable storage device for pictures and video recordings and of course network storage for your data”. "…the N0204 is decent value. It's roughly the same cost as equivalent but larger devices, and will suit those who value their shelf space more than fancy options and media streaming." 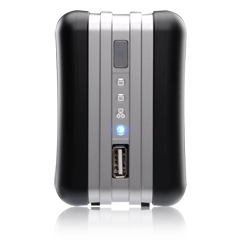 "If you travel between work sites frequently and need both storage and network services available to you, then it really doesn't get any more portable than this. Performance is quite admirable for a device of this size and very little noise is noticeable during use. The $150 price tag is very reasonable given the feature set, so just add a couple of 7200 RPM drives and you'll have yourself a mini-server that is easy to bring anywhere." Don't let its small size fool you - the N0204 miniNAS comes with RAID 0, 1, and JBOD support, which means that you can optimize your storage for speed or security. Never before has there been a storage device so small, yet so flexible. The N0204 miniNAS features a hyper-efficient design, which consumes only 25-30% of the power compared to a regular two-bay NAS device, which means you'll not only save money - you'll be saving the environment at the same time. Keep your environment quiet and temperatures low with the N0204's whisper-quiet cooling, which ensures silent operation and cool operating temperatures. Need to change one of the hard disks? No problem. With both hot plug and hot swap capability, you'll be able to swap out a hard disk and plug in a new one without even powering off the unit! You want to get things up and running quickly, which is why the N0204 miniNAS is designed for hassle-free setup. Just use the included Windows utility, and get your N0204 miniNAS rolling in no time flat. Most of all, the N0204 miniNAS knows how to have fun. Enjoy your iTunes music, digital photos, and digital video across your entire network with the N0204's robust multimedia support. 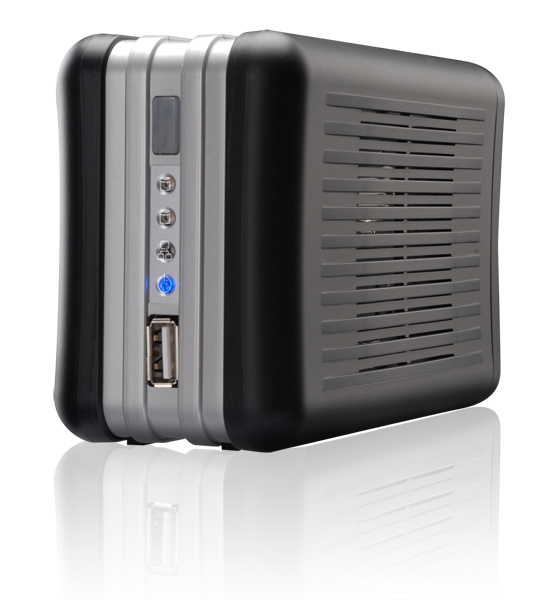 The N0204 miniNAS - the world's smallest fully-featured NAS device. Measuring a tiny 132 x 88 x 63 mm exterior, one could easily mistake the N0204 as a regular external hard drive. 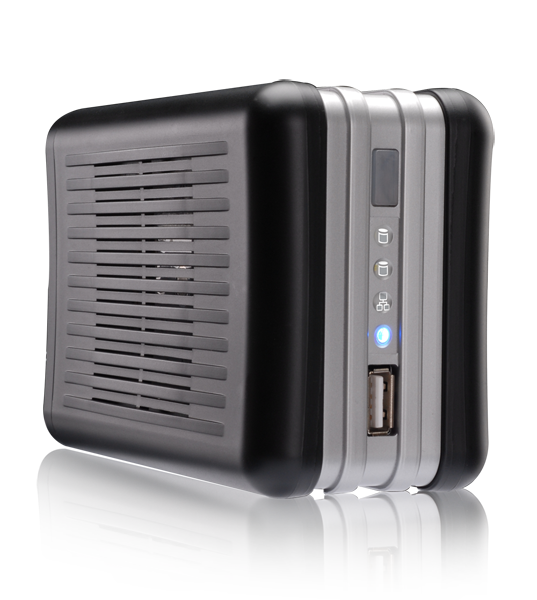 But look closer and you will see a very capable two-bay NAS device that fits right in the palm of your hand. The N0204 houses two 2.5” SATA hard disks, providing up to 1TB of storage. You can manage this storage with your choice of RAID 0, 1, and JBOD, making the N0204 the most robust pocketable storage device in existence. And because its drive bays are hot-swappable and feature auto-rebuild, you can change a hard disk without powering down the unit. The N0204 even comes with Thecus®' Nsync for remote replication as well as the Thecus® Backup Utility for total data security. With huge storage, RAID functionality, and advanced data safeguards packed into a tiny device, the N0204 is in a class all its own. Tiny but mighty, the N0204 comes with many of the features and functionality possessed by its much larger cousins. 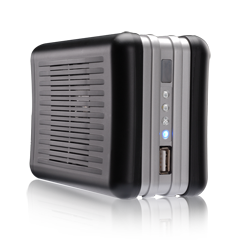 For starters, the N0204 can function as a complete media hub with its built-in iTunes server, photo web server, and media server. With the built-in media server, you can watch your videos, pictures, and music in the N0204 by using any DLNA compliant media players. Plug in a USB web cam, and the N0204 turns into the world's tiniest home surveillance server, allowing you to preview, capture and schedule image snapshots up to 640 x 480. 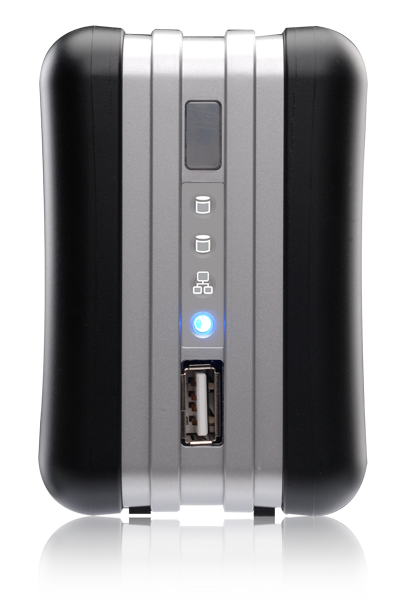 Add to that support for both Windows and MAC OS operating systems and a whole new user friendly Windows Utility to set up and link the N0204 with your PC easily, and you've got some serious storage that you can whip out of your pocket and plug into virtually any network. The N0204 miniNAS is a marvel of engineering. With advanced energy-saving capabilities, the N0204 only uses between 25~30% of the power compared to traditional two-bay NAS devices. You can even schedule power on/off for better power management. The N0204 also features whisper-quiet cooling, which means low temperatures and even lower noise during daily operation. 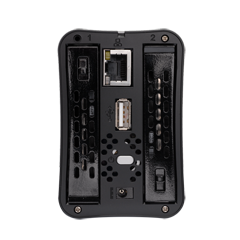 A convenient USB 2.0 port in the front and the one-touch copy allow you to copy the contents of a USB storage device to the N0204 with a single button press. You can also copy data from the N0204 to any USB disk for data exchange. 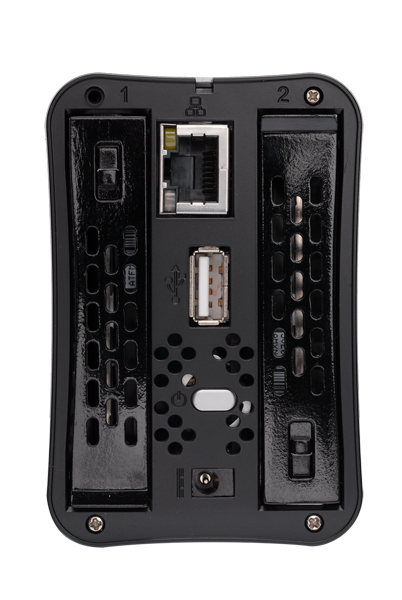 The N0204 supports USB printers, external hard disks and USB web cam. Extract ISO files directly on your NAS without the use of third party software.